Product #45762 | SKU B-95CRPL-GB | 0.0 (no ratings yet) Thanks for your rating! 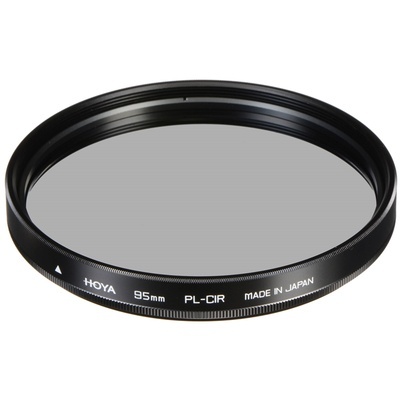 The Hoya 95mm Circular Polariser Filter helps to reduce reflections and glare by filtering out light that has become polarised due to reflection from a non-metallic surface. The light from the sun naturally becomes partially polarised due to reflecting off electrons in air molecules, causing the light to scatter into what appears as haze. A polarising filter arranges, and filters, this directionally polarised light perpendicularly to the reflected light, allowing for the absorption of much of this light. This results in a noticeable reduction of glare and reflections from non-metallic surfaces and an increase in the saturation of skies and foliage. This filter is non-coated and has approximately 93% average light transmission. It is constructed from optical glass and precision-milled aluminium-alloy frames. Approximately 93% average light transmission. Constructed from optical glass and precision milled aluminium frames. Box Dimensions (LxWxH) 6.2 x 6.1 x 1.1"